With the popularity of social media forums and review sites like TripAdvisor, now more than ever, our hotel, casino and vacation ownership resort customers are increasingly focused on providing their guests an exceptional experience. Cleanliness, interactions with the property’s staff, and amenities all factor into these reviews and our customers look to us to utilize our expertise to enhance their guests’ experiences. We achieve this by providing high quality service and by partnering with the most trusted providers in the industry. Our belief is to be the premier provider of managed services in the hospitality industry, you need to also partner with the best. After several years of exclusively using Ecolab products, we signed a national partnership agreement with the company to better create property-specific cleanliness solutions for our customers. 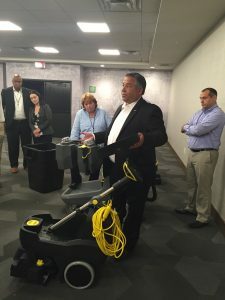 As part of each property’s opening, we work with Ecolab to determine the optimum chemicals and tools to ensure we maintain the property in first-class condition. What if a property has travertine floors or countertops in the rooms that require a particular solvent? We work with Ecolab to ensure that all materials on property, as well as the safety of your guests and our associates, are taken into account. 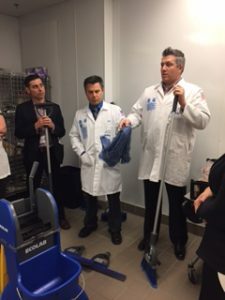 We also bring Ecolab’s Corporate Training Team to each of our new accounts to train our associates on these specifically chosen tools and chemicals to ensure they are used correctly and safely. Kärcher is a market leader in cleaning technology and equipment. That’s why we partner with them to furnish the equipment for the turn-key housekeeping, EVS and public area, stewarding and kitchen cleaning services we provide our customers. 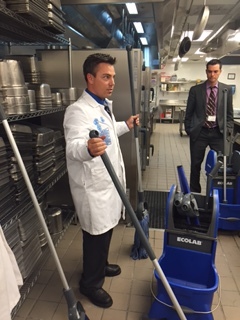 Like Ecolab, our management team works with Kärcher to select the best equipment based on the needs of each property and sets up regular training sessions and demos to teach our team how to effectively use the equipment and to keep our team on the cutting edge with the latest equipment. As part of our critical path to opening each new account, we dedicate a minimum of one full day of training to Kärcher’s equipment and how to utilize it best. Honda is known for being one of the superior choices for pressure washing machines. Because of this, we, through our subsidiary JRS International, utilize Honda pressure washers for all of our large pressure washing jobs nationwide. Honda’s track record of durability and longevity translates into a higher quality of cleanliness that our pressure washing experts provide to our customers. Ceridian, the leading and award-winning provider of human capital management system Dayforce HCM, helps companies design their workforce for maximum effectiveness and efficiency. With our commitment to our employees and being at the forefront of recruiting strategy, we partnered with the company in 2016 to provide us with innovated technology to manage all aspects of our day to day business functions including payroll, time and attendance, Human Resources, benefits, recruitment, onboarding and performance management. Dayforce HCM’s intuitiveness makes day-to-day activities productive while reducing redundancies and increasing productivity. This gives our team more time to dedicate to our customers and their needs. 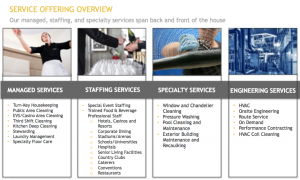 At The Service Companies, we are committed to setting the quality standard in the marketplace and keeping our customers’ properties spotless. Our partnerships with Ecolab, Kärcher, Honda, and Ceridian enable us to provide tailored solutions to our customers that we know will benefit them.